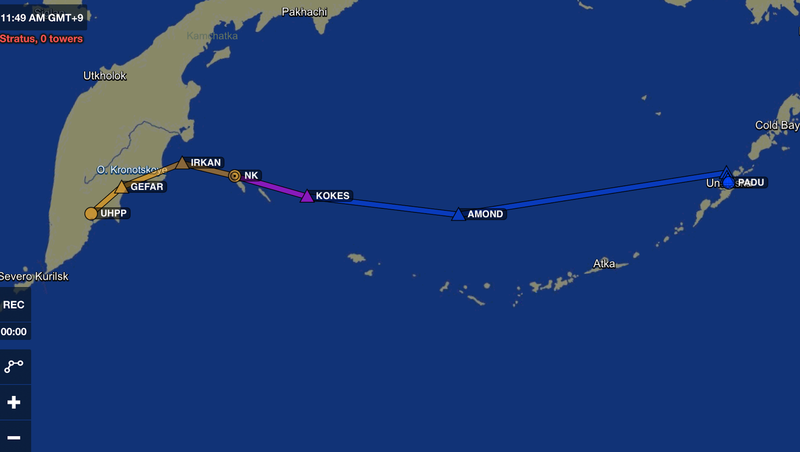 After a complex flight from Taipei, Taiwan to Petropavlovsk-Kamchatsky, Russia, the July 10/9 (depart July 10 and arrive July 9) flight from Petropavlovsk to Unalaska, Alaska on the Aleutian archipelago promised to be fairly straight-forward other than a potentially complex departure procedure from Petropavlovsk. The main uncertainty was the weather at Unalaska (also known as Dutch Harbor). In the end, the flight went as planned and on schedule. This flight was one of the shortest of the whole trip at about 1,500 statute miles (1290 nautical miles). We even were able to depart at the very civilized hour of about 9:30a local time in Petropavlovsk which was a nice change from the many sunrise departures previously. Like the arrival procedures, the departure procedures from Petropavlovsk can be complex. 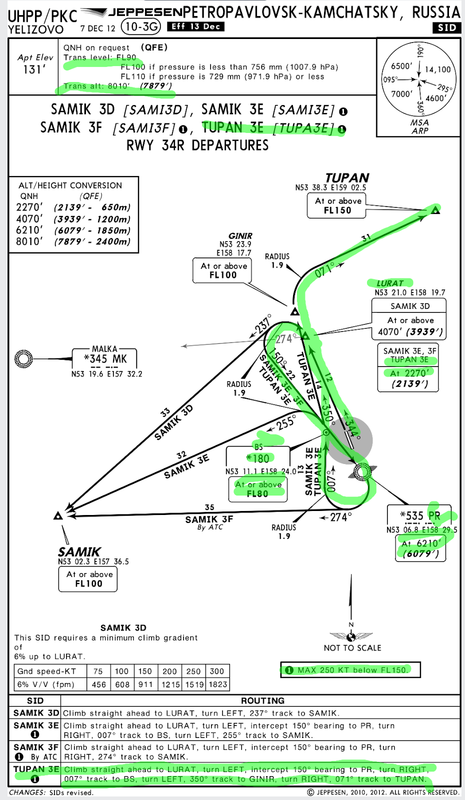 Based on our flight plan, we expected the departure procedure shown below…essentially a figure eight over the airport…. Turns out we were assigned a much simpler departure which saved a lot of time. The weather at Petropavlovsk for our departure was good with only some high clouds. So, we got some good views climbing out before penetrating the cloud layer. It would have been nice to see more of the Kamchatka peninsula which was under us for about an hour, but after Kamchatka is was just the Bering Sea so we did not miss much there. Enroute to Dutch Harbor was smooth and good weather, so a generally boring cruise phase. I had total confidence in these two excellent aviators and could relax while they manned the flight deck. 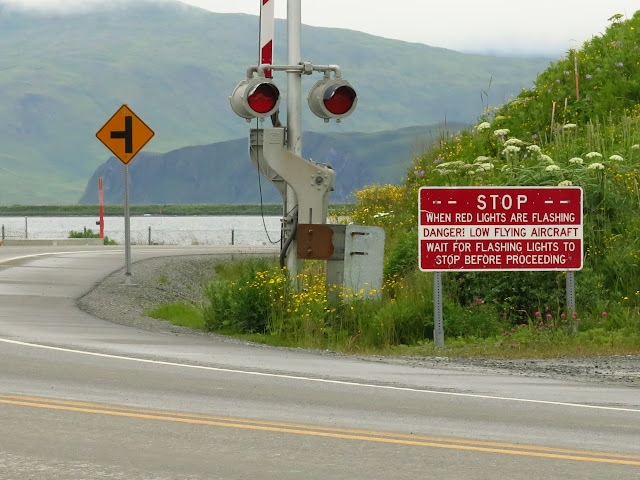 The main challenge for this trip was the weather at Dutch Harbor. Because the runway is closely tucked between some big hills, you need very good weather to execute an instrument approach to the airport (at least three miles visibility and clouds 1800 feet above the surface). Unfortunately, this area of the world is cloudy most of the summer. The main reason we wanted to go to Dutch Harbor versus other Aleutian airports was, believe it or not, it has a US Customs office. More precisely, there is one US Customs officer (Officer Johnson) there that mainly works the Japanese and Chinese ships coming and going in the harbor to pick-up fish. He told us he only clears about 4-5 planes a year at the airport, so our arrival was a bit of excitement for him. If we had not been able to get into Dutch Harbor, Cold Bay, Alaska was our alternate. It is about 180 miles from Dutch Harbor, but the instrument approaches there allow landing in much lower visibility conditions (1/2 mile visibility). However, Cold Bay does not have customs. We were told only about 20 people live in Cold Bay full-time, but the Census Bureau puts it at a bustling 108. If we had to divert from Dutch Harbor to Cold Bay, we had permission from the Anchorage Customs office to stop and re-fuel at Cold Bay and then continue on to Anchorage to clear customs. But, we preferred to spend some time in the Aleutians if weather permitted, so Dutch Harbor was our first choice. The ladies were also looking forward to a shorter flight day after several long ones. While the forecast for Dutch Harbor when we departed Petropavlovsk was right at the instrument approach minimums, by the time we arrived the weather report was comfortably above minimums and we landed uneventfully. Here are a couple of videos (from a side window) landing at Dutch…everyone was happy to be back in the USA. For landing to the northwest (we were landing to the southeast), pilots must activate a stop sign by radio to stop traffic on a road right at the end of the runway…. After the very friendly US Customs Officer Jonson cleared us back into the USA, went made it to the hotel before dinner time on July 9. We had started the day after breakfast on July 10. Go figure. A couple of days in Unalaska and then we blast off for Jackson Hole (KJAC) with a stop in Ketchikan (PAKT).